I love to bake, and I love to craft. Putting the two together is a lot of fun! I particularly love pretty packaging. I made some blueberry muffins, and I was trying to figure out a convenient and pretty way to package a few to give away. Whenever I make a pretty dessert, the last thing I want to do is put it on a paper plate. No matter how pretty your dessert, if you put it on a paper plate, it suddenly looks a little less pretty. So, to avoid that, I ran down to my craft room, and in a couple of minutes, I had this perfectly sized box to package them up! 1. Start out with a 12×12 piece of cardstock weight scrapbook paper. Score it at 2 1/2″, 5″, 7 1/2″, and 10″. If you don’t have a scoreboard, do it the old fashioned way and measure with a ruler and fold. Normally, I wouldn’t be marking it with a pencil, but I did it here so you can see the score lines better. 2. Rotate your paper 90 degrees and score at 2 1/2″ and 9 1/2″ . 3. Fold along all of your score lines. 5. Fold up the bottom of the box (the lid will be the side with the 10″ scoreline). Make any necessary trimmings to the tabs to have the box come together neatly. Then glue together. I like plain old glue stick because it gets the job done with minimal hassle. 6. You can create the lid a couple of different ways. 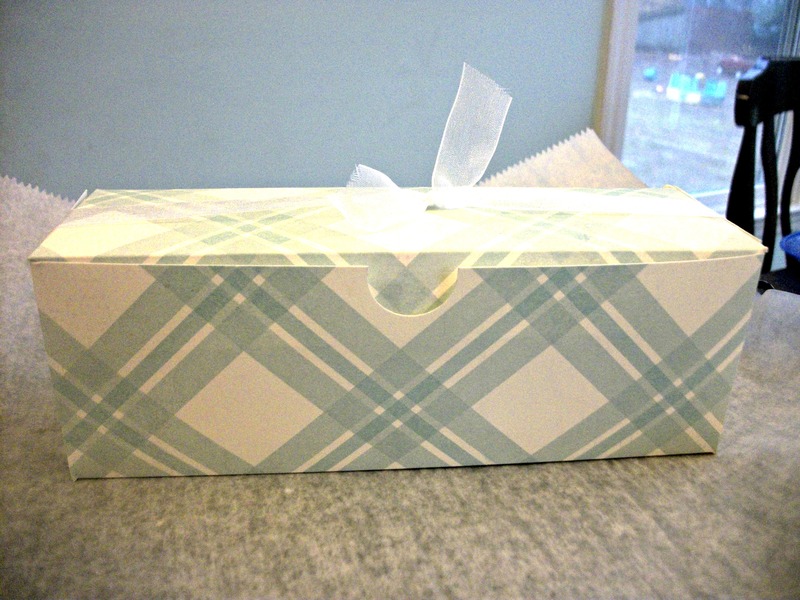 After I made these two boxes, I thought it might look even better to create the lid just like the box bottom. Something to try for next time! Version 2: Trim top sides and flap. There you have it! A pretty quick box made to fit three muffin cups perfectly.